I realized that I wasn’t really going the traditional foodie “fresh and local” route at this point, but a lot of people don’t anyway and they have incredible results. I can’t just live off maple syrup! I defrosted my Lithuanian raspberries and pondered how the company turned a profit importing them from overseas (keep in mind that raspberries grow in Canada). I kept the compote for the coconut bread nice and simple, adding a splash of lime juice and some vanilla. The tartness of the compote offset the delicate sweetness of the coconut bread and brought out the multiple levels of flavour in the dish. Of course, you don’t have to make Lithuanian raspberry compote. This coconut bread goes well with pretty much any tropical fruit or berry or even icing sugar (which, I’m pretty sure, is technically a vegetable). 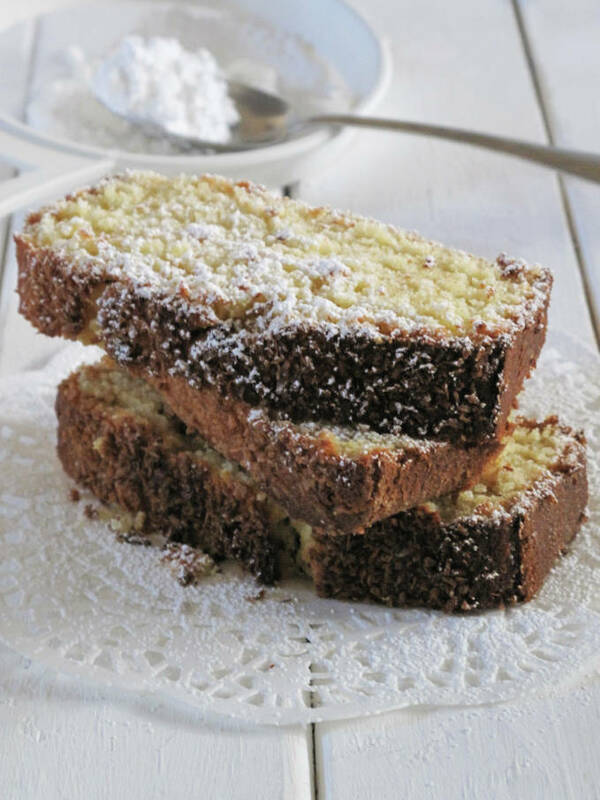 You can keep it simple by just dusting the coconut bread with icing sugar or even eating it plain. The beautiful thing about this recipe is that it can be made quickly for unexpected company (who you wish to feed), dirties few dishes, and tastes absolutely incredible! If you’re not sure if you like coconut bread, make it anyway. I wasn’t really sure if it would work, but it’s amazing. If you don’t have raspberries you can also make some pineapple-ginger compote to serve alongside the bread for a Caribbean flavour. If you’d like to go that route, my recipe for the pineapple-ginger compote is found at the bottom of my crepe post. This coconut bread/cake might also be good with mangoes.. or mangos. Not really sure which one is the correct spelling even after a lengthy internet debate. The only thing I do know about mangoes (which is pretty neat) is that a group of mangoes is called an “embarrassment” of mangoes because the mangoes are blushing. I feel as though if I use the word “amazing” to describe this coconut bread I will be snarled at because that word is overused so much to describe recipes. Oh well. This coconut bread is amazing and you will gain more friends that you can exploit for delicious desserts in the future if you make it. That’s the truth. Think about this recipe as an investment for future sugar consumption. By the way, I’m curious, how do you spell “mangos”? 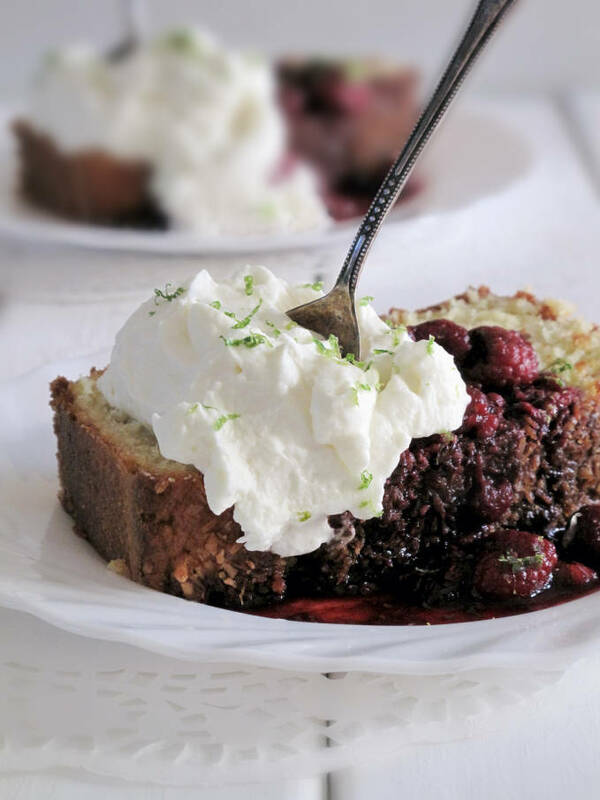 A delicious coconut bread topped with raspberry compote and freshly whipped cream and lime zest. Adapted from Baker's Royale. Preheat the oven to 350°F and butter and flour a loaf pan. Mix the baking soda with the sour cream in a medium sized bowl and set aside. 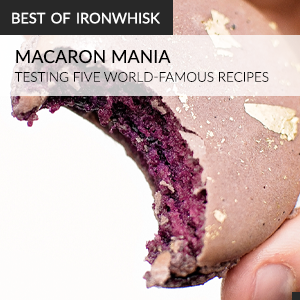 Mix together and then sift the flour, ground almonds, and baking powder together. Throw out the tablespoon or so of almonds that do not pass through the seive. Cream the butter, sugar, vanilla, and salt on low speed until light and fluffy (about five minutes). Beat in the eggs, one at a time. Mix the whipping cream with the sour cream and then fold it in, along with the dry ingredients, in three parts into the creamed butter. Fold in most of the coconut flakes and then transfer the batter to the pan. Sprinkle some coconut flakes on top and then bake for forty to fifty minutes, until a toothpick inserted in the middle of the loaf comes out clean. If the coconut on top browns too fast coat the top of the loaf pan with tinfoil. Cook two cups of raspberries in a small saucepan on medium heat with the lime juice, water, sugar, and vanilla until the raspberries release all their juice and then strain them through a seive. Discard the seeds. Cook on medium heat and add in the remaining one cup of raspberries. Cook until they are soft and then cool in the refrigerator. Slice the bread into thick slices, top with the compote, and serve with freshly whipped cream and/or lime zest. Looks fantastic Ilan. i will have to give this a try. beautiful photography too! Ilan, this dessert creation of yours looks absolutely astounding! YUM!! I think it’s mangoes. The photography is amazing ;) and of course so does the bread! I want to try a piece right now! Oh gosh! I can’t wait to try this. It looks absolutely delicious. Coconut and raspberry has always been one of my favourite combination. I’m definitely not lucky enough to live by a coconut tree….NY isn’t exactly the most tropical place in the world :) I like the raspberry/coconut combo! 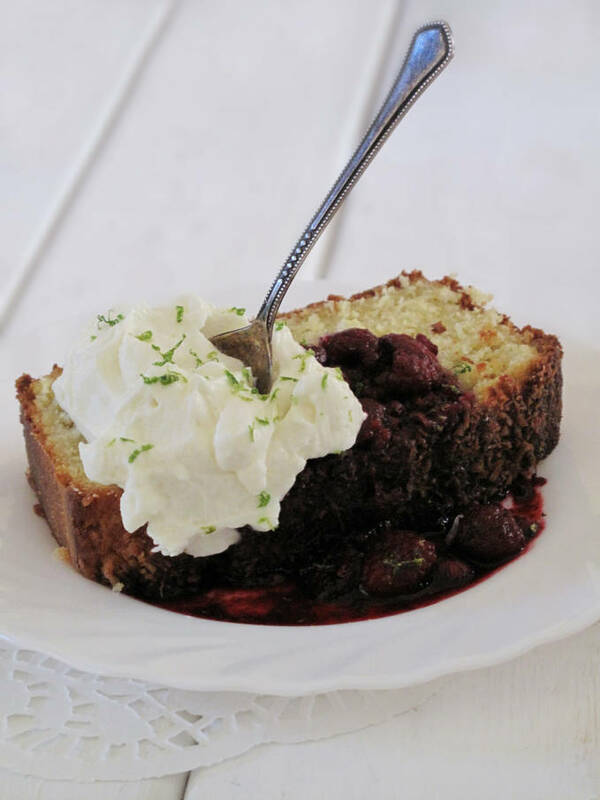 I love a sour cream cake and these berries are perfect with it. Ooooh I love that coconut bread! Looks amazing! Oh, wow! That looks amazing! Even with frozen Lithuanian raspberry compote (haha, I use frozen cherries ALL the time because I hate pitting them!) Perfection! Can you please mail me a slice! I am having a dinner party in a couple weeks and have just decided what the dessert will be. Thank you! Love the lame jokes too! Are you getting your homework done? Are you taking a Foods Class? I’m happy that someone likes my lame jokes! Mmmm. 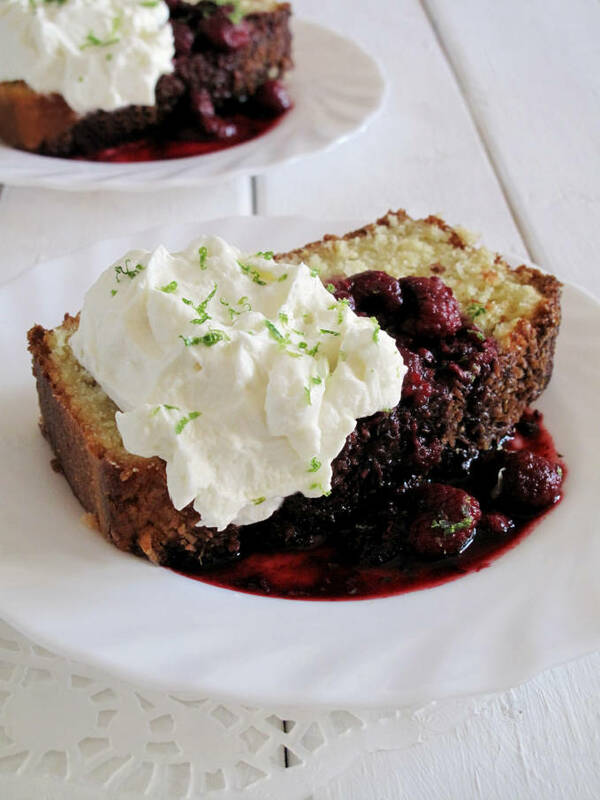 The coconut bread looks great by itself, so I imagine it’s amazing with this raspberry topping!